PubMed Central, : Mol Med. 2008 Mar–Apr; 14(3-4): 205–212. Published online 2007 December 13. doi: 10.2119/2007-00091.Rupprecht. Mechanisms of the borrelia to evade the immune system. 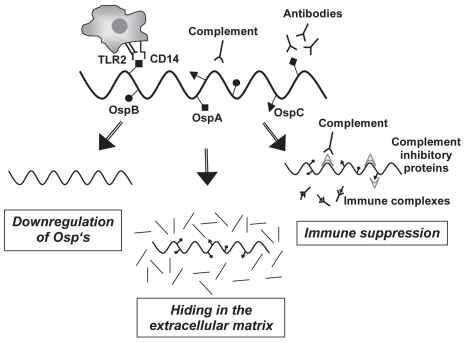 Borrelia are recognized by immune cells through TLR2 and CD14 and attacked by complement and antibodies (upper row). to be protected from recognition and subsequent killing. Mol Med. 2008 Mar–Apr; 14 (3-4) : 205–212. Published online 2007 December 13. doi: 10.2119/2007-00091.Rupprecht.